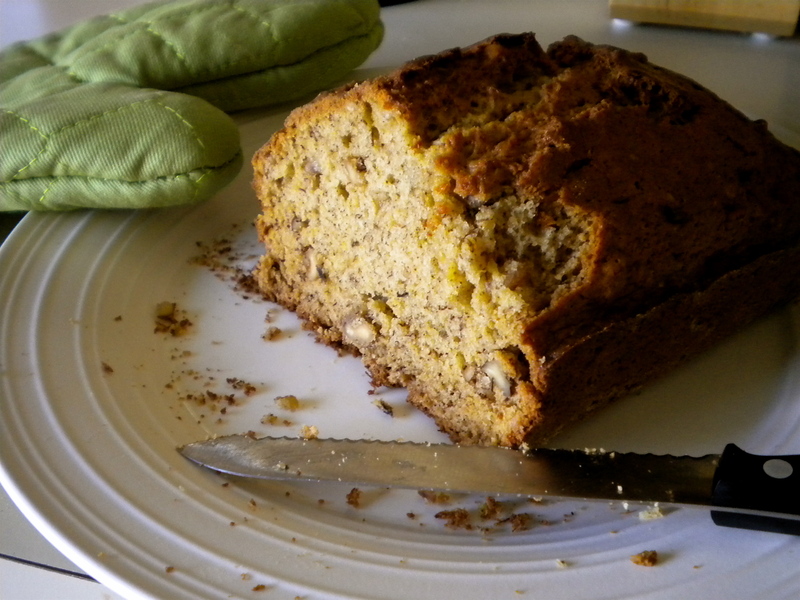 Best Banana Bread – Voila! Good ol’ banana bread. We’ve all had it. We all have different variations on the same basic concept. I’ve made it 100 times. But I am here today to tell you this is the best banana bread. It has a crunchy crust which surrounds a soft, moist center which is irresistible. This is perfect for summer brunches on the balcony, breakfast on the run or lazy weekend mornings reading the paper. Preheat oven to 350. Grease and flour loaf pan. 1. Whisk together flour, sugar, baking soda, salt, cinnamon, cloves and toasted walnuts in a large bowl. Set aside. 2. In a medium bowl, mix mashed bananas, yogurt or sour cream, eggs, butter and vanilla. 3. Lightly fold in the banana mixture into the dry ingredients with a rubber spatula until just combined and the batter looks thick and chunky. Pour batter into loaf pan.